Social media is quickly becoming the next major marketing horizon the problem is, according to Nate Elliot, Forrester vice president and principal analyst, is that brands aren’t allocating ad spend to match social media uptake. The main reason being given is that marketers are holding back because they can’t prove any real ROI on their ad spends on social media networks like Twitter and Facebook. 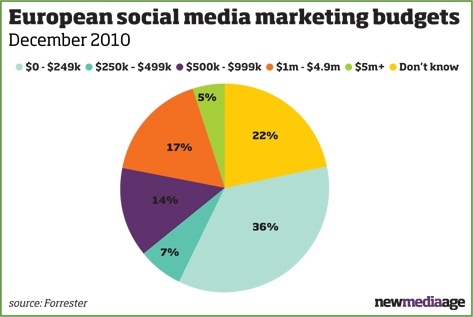 According to the report authored by Elliot 36% planned to spend less than $249,000 on social media in 2011 and %22 did not know what their budget for was for social media in 2011. “Some brands say they have a success story but they can’t actually prove or connect social media to real measures of success such as brand awareness or sales increases,” said Elliott. According to the research, the biggest challenge for marketers was measurement and ROI (17%) and uncertainty of success (16%). Elliott said sites such as Facebook and Twitter should be working with brands to help generate more effective measurement standards.